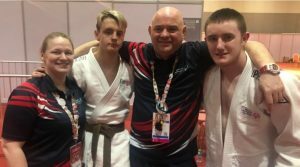 There’ll be plenty of smiles in the Henaghan household when Team Great Britain Special Olympics judo athletes Daniel and Denise bring their medals home. Daniel and his younger sister, Denise, won gold and bronze respectively in their judo division competition held at the Abu Dhabi National Exhibition Center (ADNEC). Sixteen-year-old Denise was awarded her medal on the first day of the judo competition, with older brother Daniel, 17, winning his on day four of Special Olympics World Games Abu Dhabi 2019. The St Thomas More RC Academy pupil said he plans to take his medal into school to show his teachers, friends and fellow pupils. Daniel defeated German SO athlete Kim Law in his first game before going on to beat Rupinder Singh from SO Bharat. In his final match, the British athlete got the better of Kristof Meeus of SO Belgium. To find out more information and to read the full article go to the Games website. Pic caption (left to right) Emma Imrie, Philip Brodie, Johnny Imrie and Daniel Henaghan.